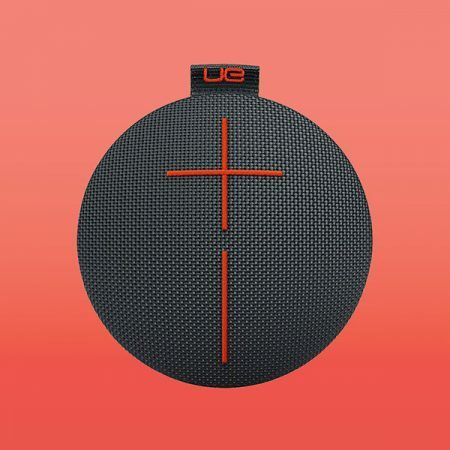 We design game-changing products imbued with meaning. Our designs create brands, inspire loyalty and shift markets. We create naming architectures and names that are meaningful to your customers and productive for the positioning and branding of your products. We design logos that are unique, memorable and that reinforce your brand in meaningful ways. We prototype and iterate across contexts and platforms so that you’re confident that your logo has staying power wherever you need it. 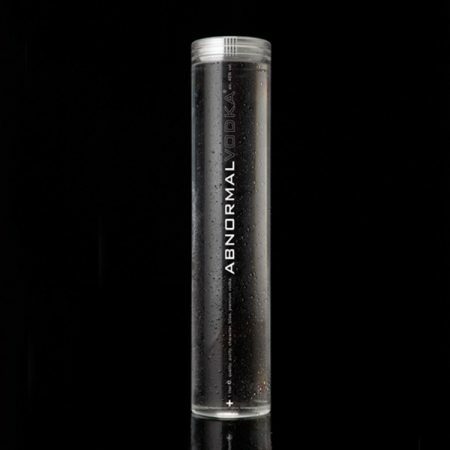 Packaging literally sets the stage for the experience of your product. 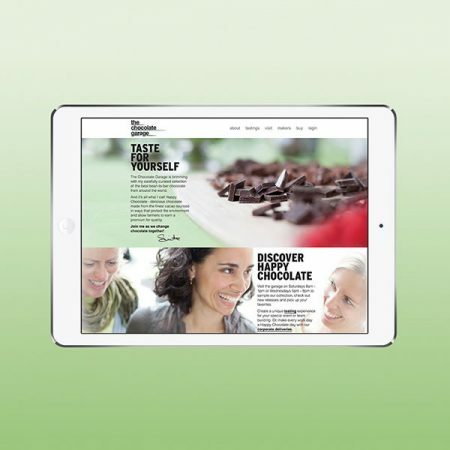 We are at the forefront of providing out-of-box-experiences that delight and inspire while respecting the bottom-line. We make your brand identity come to life with the design of visual styles, typography, iconography, color themes, photography, video and other brand assets that seamlessly translates from the physical to the digital. We spark conversations and viral moments for your brand with show booth and trade show designs that are memorable, on brand and that break through the noise to directly appeal to your targets. 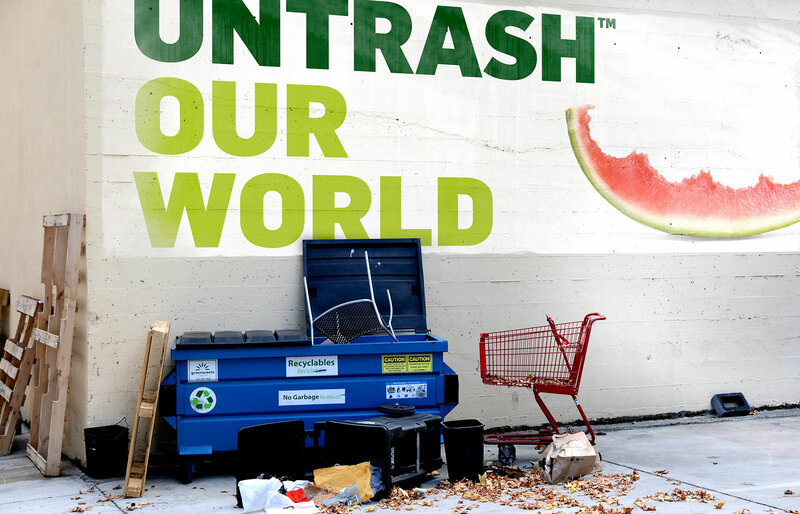 The evocative, beautiful images and positive messaging on the Untrash products help people think differently about trash. 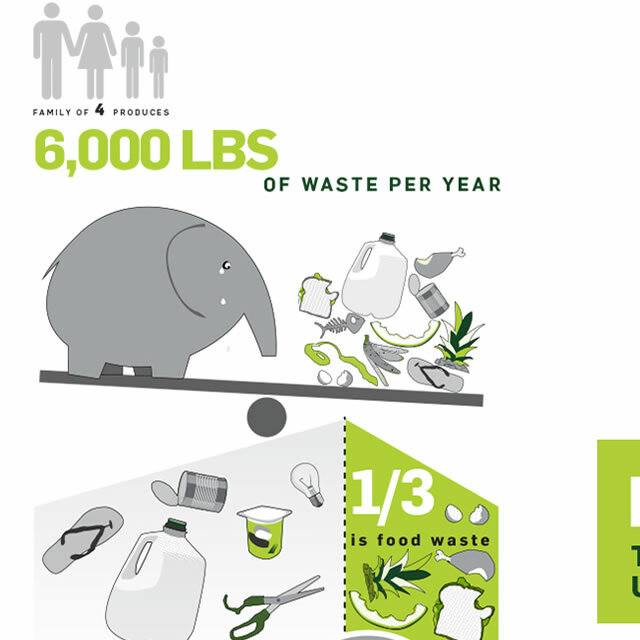 More and more people want to make choices that don’t negatively impact the environment. But ignorance, inertia, and inconvenience get in the way. 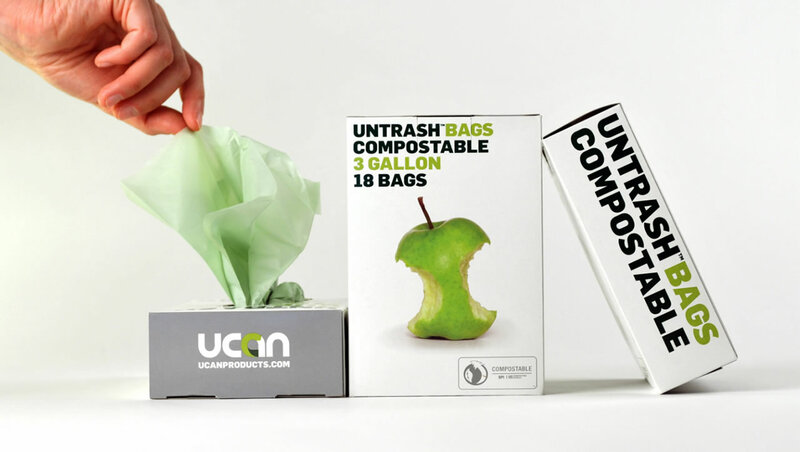 And what may seem trivial, but is in fact an important driver of purchase decisions, the packaging for many green products is perceived as unattractive and uninspiring. Not the packaging for The Untrash Products. 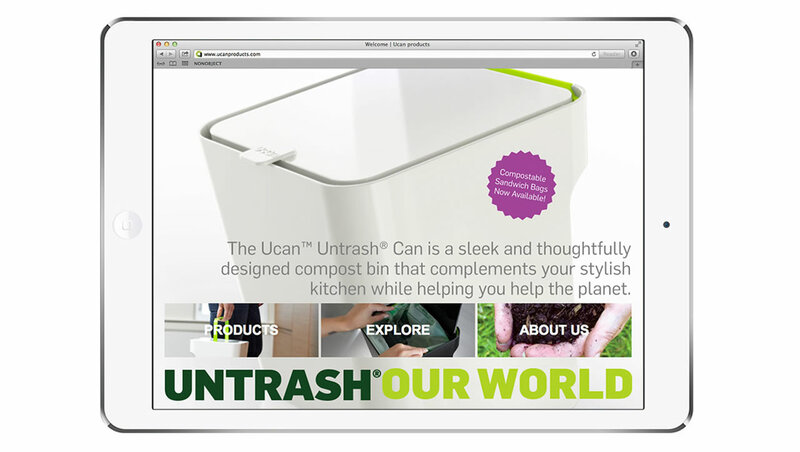 Every time consumers grab an Untrash product off the shelf they feel pleased, even excited, that they made the switch. 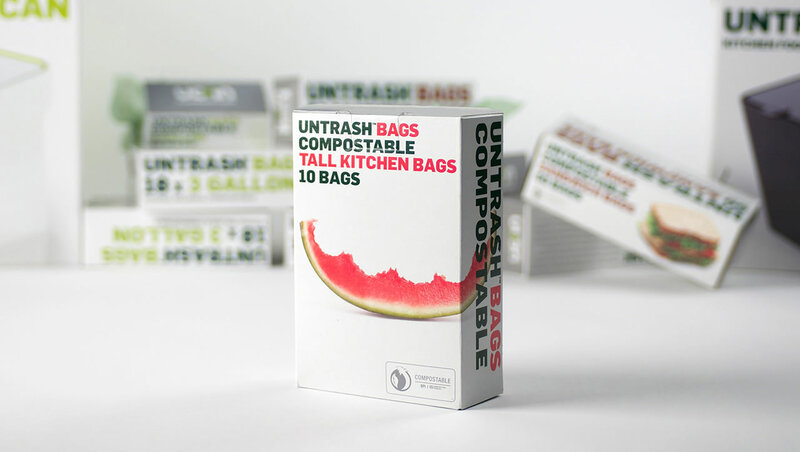 The packaging for all Untrash products helps people think differently about trash through clean, beautiful images and positive messaging. 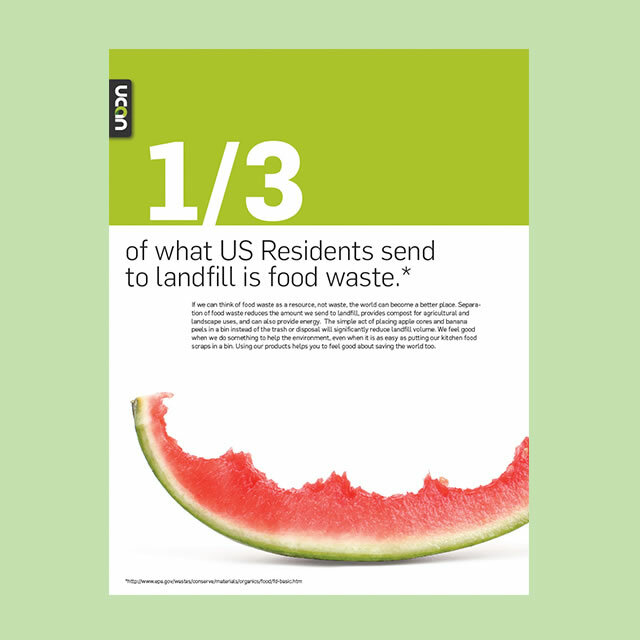 A half-eaten piece of watermelon and an apple core against a bright, white background look appealingly fresh rather than something headed for the trash. Together with the graphically bold typography and the messaging content reduced to its key essentials, refreshingly free of guilt-trips, the packaging conveys an opportunity of positive change and a call to action. This is particularly important for a new brand in a competitive market dominated by established players, and deeply ingrained consumer usage patterns. 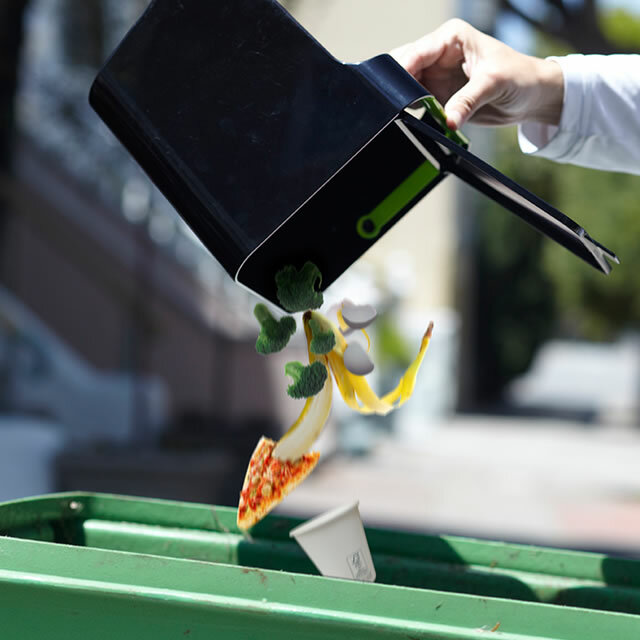 While the Untrash bags are all compostable, the Untrash can for food waste is made in the United States from a minimum of 50 percent recycled polypropylene. 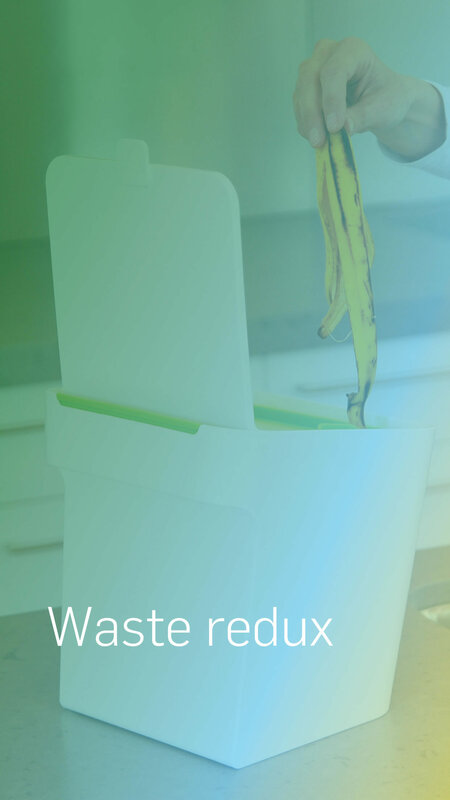 A food waste container is most effective if it’s placed in close proximity to where the food waste is generated, rather than under the kitchen sink. 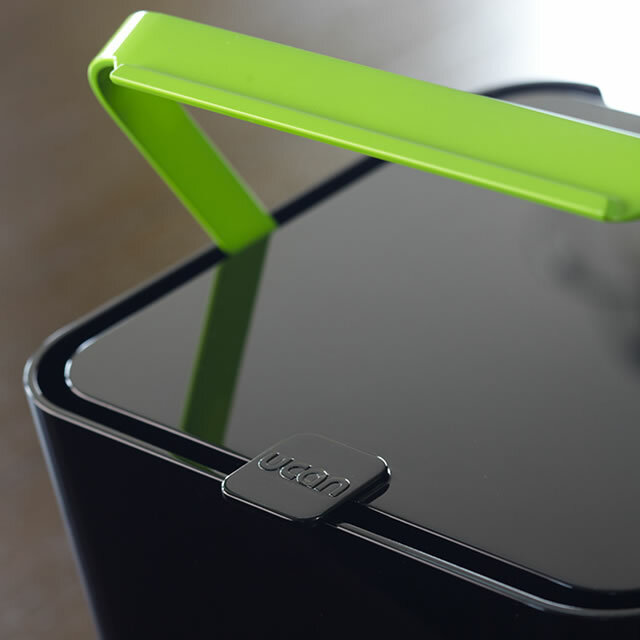 With a square shape and high-gloss finish, the Untrash waste can more closely resembles a high-end kitchen appliance, than the typical containers for food waste composting. 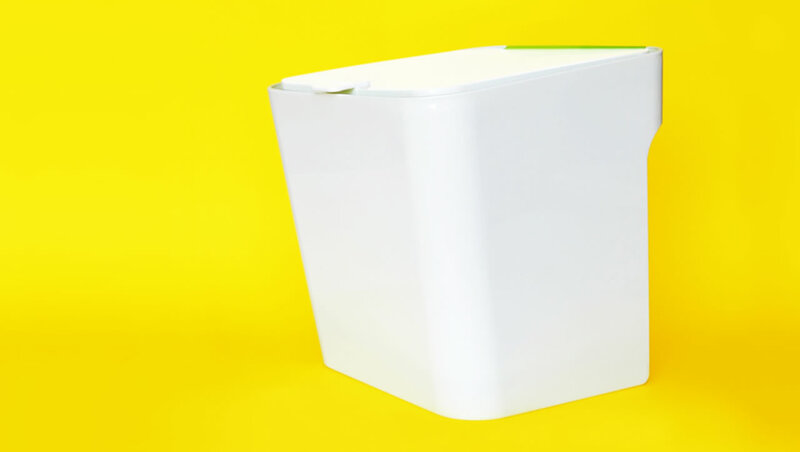 Hidden ventilation, subtly placed between the lid and the bucket, keeps odors to a minimum. 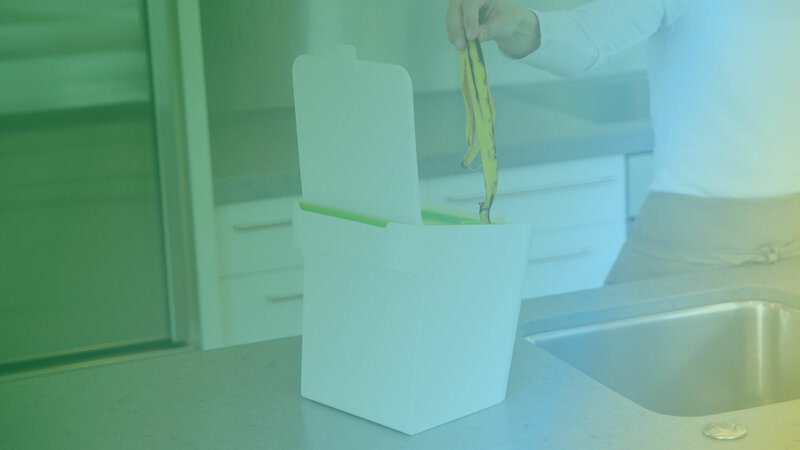 A ring on the interior of the can securely holds a compostable bag in place, without the ugly and mess-catching plastic bag overhang that is otherwise so common with trash cans. 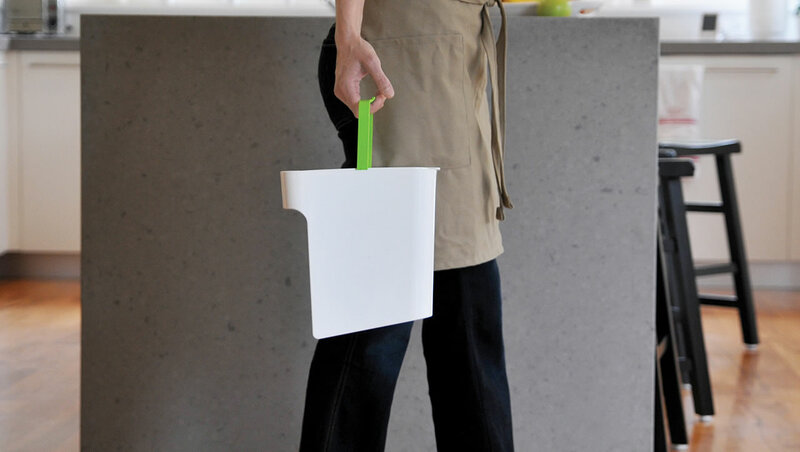 A carrying handle folds down when not in use, and can be used to secure the can on a hook if needed. An ergonomical grip on the back of the can makes it possible to empty it with one hand, with the lid easily flipping open for disposal of the content. If the can ever needs a deep clean, just pop it in the dishwasher. 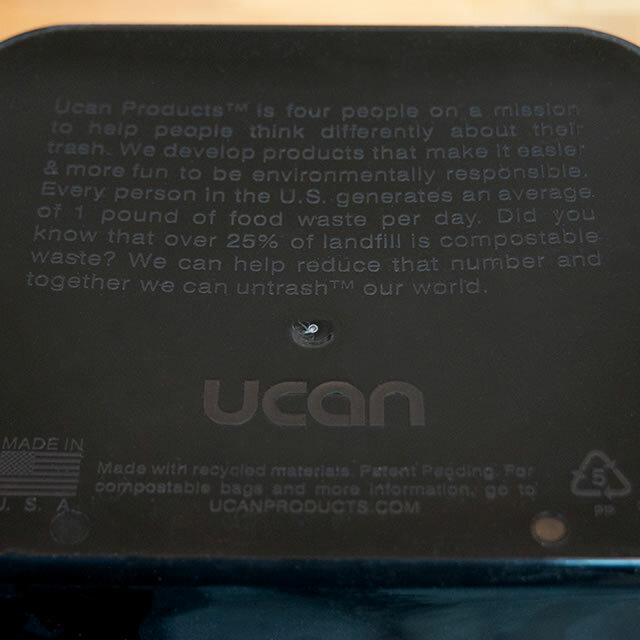 When you turn the can over, the unexpected yet inspiring message on the bottom of the can reminds you why composting food waste makes a difference. 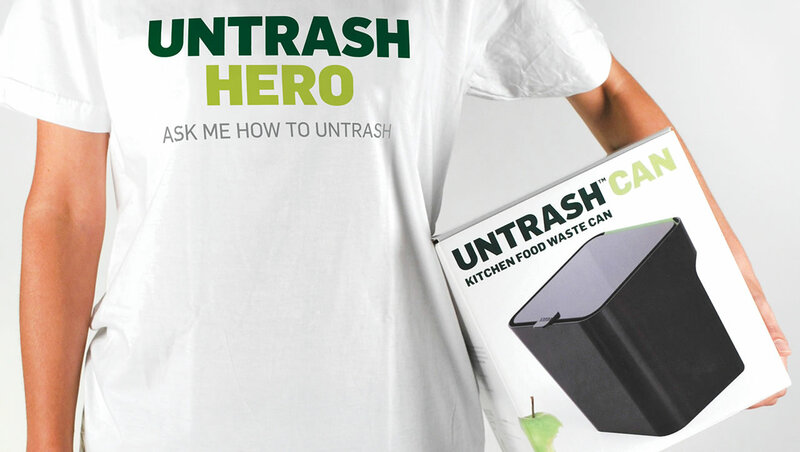 The power of the appealing, positive imagery and messaging of the Untrash brand has helped Untrash get established in municipalities across the country, the latest one being New York City.